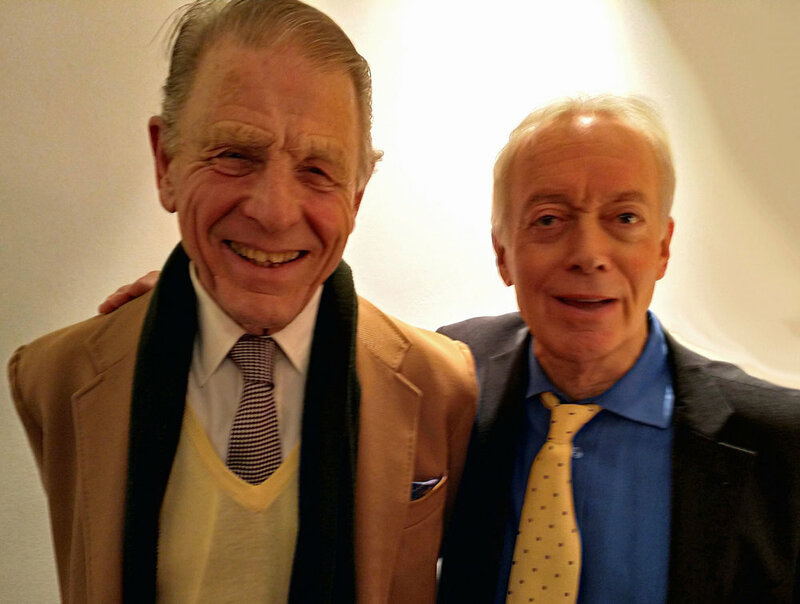 The guest speaker at the 2018 AGM was veteran actor Edward Fox. Our President Nickolas Grace introduced Edward and a lively discussion, covering a wide range of topics, ensued. In some places the discussion was so lively that Edward commented at the end of the evening ‘I hope you don’t think I’m a total rotter’! Edward argued passionately that the decline of repertory theatre is seriously affecting the theatre industry because repertory enables young performers to learn from working alongside experienced actors and acting school is only the beginning of the journey. Edward also expressed strong views on the union Equity. He hasn’t been a member for 40 years but Nickolas did point out that Equity provide protection over contracts, pay and insurance, which is particularly important for impoverished members of the profession. Edward didn’t go into acting straight away when he left school – in fact he claimed that after Harrow he just wanted a life of debauchery! But National Service with the North Lancashire regiment followed and then he auditioned for RADA. Despite a successful career on stage, Edward is still probably best known for film and television roles such as The Day of the Jackal (1973) and the television series Edward and Mrs Simpson (1978). Frankie Lonsdale (Donaldson), Edward’s aunt, had written the biography of Edward VIII on which the series was based and Edward claimed that, when they thought the lines weren’t good enough, he and Cynthia Harris (playing Mrs Simpson) worked with Frankie to smuggle in rewriting that they felt worked much better than the original script. Frankie was the half-sister of Edward’s mother Angela Worthington, a very good comedic actress, and the illegitimate daughter of Frankie’s father, the playwright Freddie Lonsdale. Because illegitimacy was such an issue – Angela was born in 1912 – she had no contact with her father until very late in his life. Many of the Fox family have had careers in theatre – and Edward’s son, the actor Freddie Fox, has previously proposed the toast for the Vic-Wells Association at Shakespeare’s birthday party; however, I hadn’t realised that family connections were the reason Edward was brought in to take on the role of Winston Churchill in the 2013 play The Audience – starring Helen Mirren as the Queen – when Robert Hardy became ill before opening night. The show’s producer, Robert Fox, knew his brother Edward could learn lines very quickly and Edward had only 3 days to rehearse before the opening performance. Edward quoted what he called ‘the best lines in the world’, taken from Twelfth Night. When Duke Orsino offers Feste payment ‘for his pains’ in singing, Feste replies ‘No pains, sir, I take pleasure in singing’. Edward said that he felt very fortunate to have taken pleasure and ‘no pains’ in his work – and his hope in the theatre is always that audiences go out feeling pleasure, and more alive. The Vic-Wells Association of today continues the social programme instigated by Lilian Baylis as "A fellowship of playgoers drawn from and uniting all parts of the house". The "playgoers" being the audiences attending Shakespeare, Opera and Ballet performances at the Old Vic and Sadler's Wells theatres. Although, of course, today the English National Opera is no longer in the "Vic-Wells" theatres and the play programmes are more extensive. See more about our social events by following this link to our Social Events page. The Association's Annual General Meeting is usually held at Sadler's Wells theatre in November. Members may be given the opportunity occasionally of going on organised visits to places of interest. Details are announced in the Broadsheet in advance of the time of the visit.